Attorney Trixie Cruz-Angeles said that she does not fail to acknowledge that former President Gloria Arroyo had her misdeeds, but she just might be what is needed in the Congress. This remark was shared via a Facebook post which was subsequent to Arroyo's recent jump from Pampanga 2nd district representative to Speaker of the House of Representatives this Monday. Arroyo, who was previously detained for her alleged graft and corruption during her presidency, rose to the position just moments before President Rodrigo Duterte's State of the Nation Address, replacing Speaker Pantaleon Alvarez. "Lets just call it what it is and not make any heroes or martyrs out of flawed (possibly criminal) politicians. GMA as Speaker is political expediency. Speaker Alvarez, while good at passing the president's legislation, was hampered by bad relations with his own fellow congressmen. Kagagawan din naman nya," Cruz said. She said that the only choice is to accept Arroyo's new position. "Pero wag nyong gawing hero ang lola. Acknowledge natin na acquitted sya (pero grabe ang behind the scenes galawan dyan) at aminin na victim din sya ni Noynoy Aquino. Pero may genius sya for political maneuvering and survival. Tignan nyo nga at naka agaw na naman sya ng bagong pwesto, after ilang beses nyang sinabing di sya interesado maging Speaker," the lawyer said. 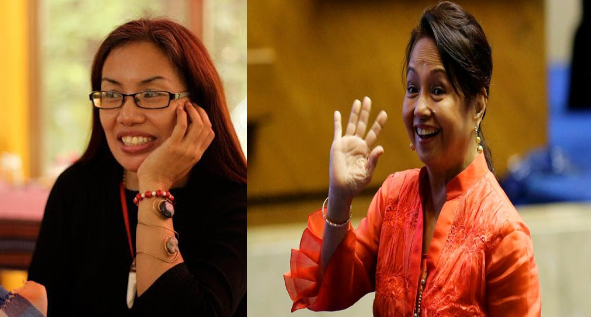 She added that perhaps Arroyo is the person needed so that the plan of changing the country's constitution to cater a federal republic, may push through. "Baka nga sya ang kailangan para makapasa ng amendments sa saligang batas, or bagong saligang batas. Tignan natin at mukhang yan ang next big thing para sa Kongreso na makapag labas ng final draft para baguhin ang constitution. Yung draft na reflective ng aspirations natin. Hindi yung kani-kanila lang sa lehislatura.Yung sa taong bayan," Cruz said. "Kung sya ang may kakayahan, sige, bigyan ng chance. Realpolitik ito, baka kailangan. But I don't have to like it," she added. When Duterte arrived at Batasan for his speech before 4 pm, it was still Alvarez who welcomed him, along with Senate President Vicente Sotto III. 161 members of the House voted for his ouster. "Lets just call it what it is and not make any heroes or martyrs out of flawed (possibly criminal) politicians. GMA as Speaker is political expediency. Speaker Alvarez, while good at passing the president's legislation, was hampered by bad relations with his own fellow congressmen. Kagagawan din naman nya. So sige. Kailangan si GMA. Tsugi si Alvarez. Pero wag nyong gawing hero ang lola. Acknowledge natin na acquitted sya (pero grabe ang behind the scenes galawan dyan) at aminin na victim din sya ni Noynoy Aquino. Pero may genius sya for political maneuvering and survival. Tignan nyo nga at naka agaw na naman sya ng bagong pwesto, after ilang beses nyang sinabing di sya interesado maging Speaker. Baka nga sya ang kailangan para makapasa ng amendments sa saligang batas, or bagong saligang batas. Tignan natin at mukhang yan ang next big thing para sa Kongreso na makapag labas ng final draft para baguhin ang constitution. Yung draft na reflective ng aspirations natin. Hindi yung kani-kanila lang sa lehislatura.Yung sa taong bayan. Kung sya ang may kakayahan, sige, bigyan ng chance. Realpolitik ito, baka kailangan. But I don't have to like it."